Whether you already started or just planning to open a restaurant, first you have to design the place itself. Sounds complex? No worries, we are here to help. Imagine a place for socialization, comfort and memories. Restaurant is more than just eating factory. Thinking long before the design and menu, don't forget about safety, ergonomy and profitability. There's a lot to consider when it comes to creating a restaurant floor plan. It should be functional and practical to increases staff productivity and sales. The idea behind the restaurant should determine the materials, the flow of the spaces and the placements of walls. Each customer should see good food-service architecture from every seat. Atmosphere and appearance of the restaurant are most important points. Besides designing a new restaurant, it will help to renovate an existing space, host an event, or document emergency evacuation plans. Any restaurant plan should create a quality dining experience and a positive work environment for your employees. 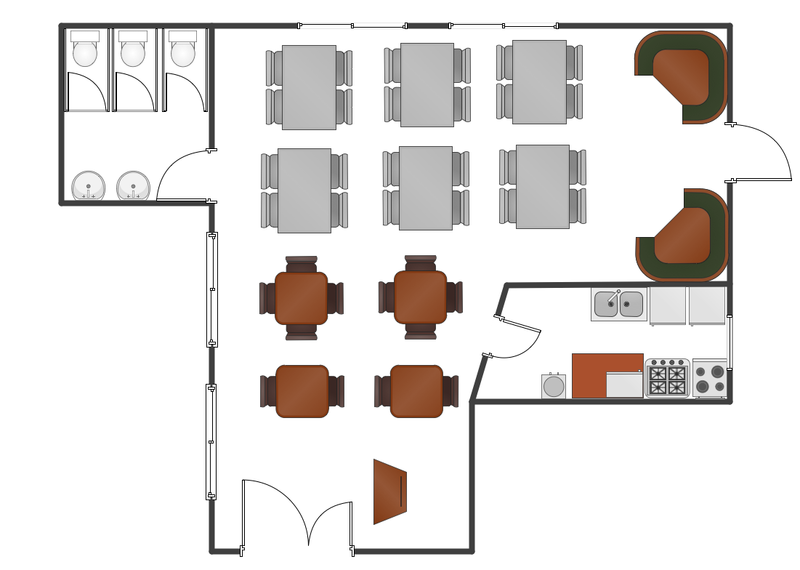 ConceptDraw for successfully planning your restaurant floor plans. That tool can help you to plan what you will require. The library of more than 1000 furniture symbols provides images for a variety of objects including furniture, kitchen and bathroom fixtures, lighting fixtures, and cabinets that can help you to visualize your restaurant. Sample 1. Restaurant floor plan sample. Solution Building Plans from ConceptDraw Solution Park provides samples, templates and vector stencil libraries with design elements for drawing restaurant and cafe floor plans. Use ConceptDraw DIAGRAM diagramming and vector drawing software enhanced with Building Plans solution to draw your own restaurant and cafe floor plans. The ConceptDraw DIAGRAM v12 Planogram Software and Retail Plan Software offers powerful tools of Enterprise Architecture Diagrams Solution for visualization the market analysis and easy making successful Retail Plans and Planograms with useful detailed recommendations about placing products and optimization the shelf space. Any factory needs a clear scheme of all the equipment used in the manufacture processes. So, if you want to place all your machines and equipment on one diagram, you need a good diagramming tool for that. For instance, you can find all the design elements you might need, such as lathes, milling machines or saws on ConceptDraw DIAGRAM v12 Solution Park in Plant Layout Plans solution in appropriate libraries. This drawing represents the Machines and Equipment library delivered by ConceptDraw Plant Layout Plans solution. This vector library is supplied along with other libraries related to industrial architecture planning and interior design. Just planning the proper facilities in a proper right place, allows to manufacture a product in the most effective and economic way. Objects containing in these libraries will be helpful for architects and engineers dealing with industrial buildings design. They are intended to use for designing layouts of plants, warehouses, manufacturing workshop etc. Sometimes, it's not easy to fit everything you need into your premise. So, you can discover how to use building plan examples and get inspired from viewing them. You can find a lot of office layout and floor plans templates in the ConceptDraw Solution Park. This drawing shows the sample of interior design of a middle-size restaurant. It was designed with a help of ConceptDraw Cafe and Restaurant Plans solution. Extensive libraries of vector objects of the interior element enabled us to design this example quickly and with no efforts. You can use this interior plan as a template while designing an interior for your own restaurant. It will help you to compose and organize elements of the interior, to bring a balance between free space and furniture in your establishment. It can be applied to organize and arrange the furniture, equipment and decorative elements in the restaurant interior and achieve balance between furniture and free space.